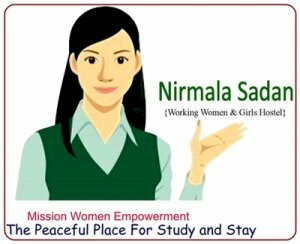 Nirmala Sadan SDWS provide accommodation for working women & girls who can live in a family atmosphere amongst the inmates coming from various parts of the country to the cosmopolitan city of Delhi having no safe place to stay, on getting an employment and education. Deluxe Rooms- Single, Double & Triple sharing occupancy room with attached toilets. Total - 7. The Hostel is situated at the prominent place having fully secured for women. Market facility is available very close to the hostel. The hostel also approachable by Delhi metro. The hostel is having sufficient open space, spacious kitchen, dining hall, and common room. The hostel is to be run the SDWS of repute who will be taking care of all inmates of the hostel. It’s prime location in Dwarka Sector - 7, has an access to all institutes and offices. Very near to sec-9, Dwarka Metro Station. Our service rooms are toilet bath attached, innovatively laid out, stylishly furnished with bed, bed sheet, pillows, study table, chair, almirah. We have developed a concept of neat and clean rooms with added comfort to stay and concentration on study without spending more than the price of outside renting places. •Dining Hall – Three times meals, Two time tea. We are providing a complete package for monthly bases to all facilities. Ordinary Room: Room with common toilet of 2 Rooms. Deluxe Rooms: Rooms with attached toilet bath.